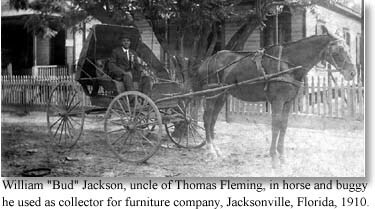 In 1916, there weren't many job opportunities for blacks in Jacksonville, or anywhere else in the Deep South. One of the few skilled jobs that blacks could get was to work on the trains. There were black engineers, firemen, brakemen and conductors. But as soon as they unionized the railroads, they got rid of the blacks in the operational crew, so that they could only work as porters or in the dining cars. My father traveled a lot, railroading as a Pullman porter and working at sea. He'd been over to Europe as a cook on a freighter  none of the transatlantic passenger ships hired blacks  and had been exposed to a lot of things that other people hadn't. Blacks were pouring out of the South to escape the segregation, particularly from those states that border the Atlantic Ocean. I had been living with my grandmother, and after she died, my father moved up to New York. It was the mecca for Southern blacks; they wanted to get to Harlem even more than Chicago. He left me down in Jacksonville with my uncle, then wrote and said he wanted me to come to New York and join him. He knew the crew members from quite a few ships, since they would all come to Jacksonville. So he contacted some friends on the Clyde Line, which had a fleet of steamers along the East Coast, and asked, would they bring me to New York? They said yes. I left Florida around about April 1916. All the arrangements were made in advance. My uncle brought me down to the dock in his horse and buggy, with my bag. There he met one of the ship's porters, who was waiting to see a black man bringing a little black boy. The porter introduced himself and said, "Is this Courtney Fleming's son?" My father had asked him to look out for me. Then I bid my uncle goodbye. The porter took me into the living quarters of the stewards department and said, "You stay in here and stay quiet until this ship clears the harbor. I'll come and tell you when you can go up on the deck." When the other members of the crew saw me, they knew I was a stowaway because this sort of thing went on, and there weren't many blacks on the ship as passengers. The Clyde Line's deck crew and engine department were white. The stewards  that included the cooks, waiters and porters  were all black, on every ship of the Clyde Line. That's the only category of job they could get, on any line that hired blacks. But most ships didn't hire blacks at all. We came into Charleston, South Carolina the next morning. I didn't get off. My first cousin, Sam Fleming, met the ship down there and came on deck. It was the only time I ever saw Sam. When the ship reached New York, my father took me to his apartment on 133rd Street in Harlem. The center of black activities was 135th Street; the Lafayette Theatre, which had all black entertainers, was located there; the YMCA, which was a cultural center for blacks; and a branch of the New York Public Library. The day after I arrived, my father put me in school, P.S. 89, at 135th Street and Lenox Avenue. The school had as many white kids as black kids, and all the teachers were white. In Jacksonville, all I saw was black teachers. There were still a lot of horses in Harlem. They pulled wagons called drays, to carry goods around. Trucks were slowly coming in. All the buildings in Harlem had gas at least, and many had electric lights. For every apartment, the gas company installed a meter with a coin slot, and you had to put in a quarter for a certain number of hours. I noticed right away that New York was different. You could sit in the streetcar where you wanted to, not just in the back. Blacks could vote. In New York, my father promptly registered as a Republican and always voted. 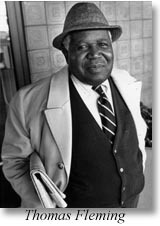 He attended a lot of political meetings: at one he went to on 135th Street, Teddy Roosevelt came out and spoke, after he had left the White House. Most restaurants would serve blacks, but it depended upon which one you hit. Some were so expensive that they immediately suspected that the blacks wouldn't be able to pay. It wasn't until the early 1920s, after I had left, that the Cotton Club opened in Harlem. All the entertainers, waiters and other personnel were black. But blacks could never go in as paying customers, even if they had thousands of dollars in their pocket. The place was owned and run by gangsters, and they didn't want them there, because they were appealing to the Ivy League school crowd and other whites with money.